92.7 BIG FM, India’s No.1 FM radio network, known to offer its listeners highly engaging entertainment, announces the launch of an exclusive national campaign titled BIG Socho…BIG Jeeto. The all-new radio based game show is a unique initiative for the festive season, giving listeners across India a fantastic opportunity to win big prizes and donate the same to the less fortunate. Listeners of 92.7 BIG FM can stay tuned to the excitement which will air every hour for 7 days starting 28th October between 9 am and 7 pm. To participate in the contest, people across India need to register on SMS. Through a random selection every hour between 9am to 7pm, one listener will get a chance to play. 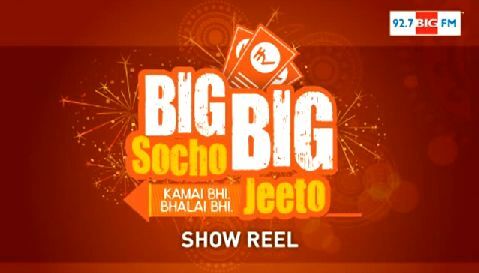 There will be a set of five questions in two different stages in BIG Socho BIG Jeeto. Once a participant answers three successive questions correctly, he or she wins a gift hamper. The participant will be given the option to claim this hamper or go ahead answer 2 more questions and win a bigger prize. If s/he wins, they claim the bigger prize(BIG Jeeto) and BIG FM will donate Rs 500 to a prominent Non Governmental Organisation (NGO)(BIG Socho). If the answers are wrong, the player is eliminated. Each 92.7 BIG FM station will invite officers from the government, police, and Bollywood celebrities to participate in the contest on-air. Contest winners will also get to speak about their experience and what they’ve won. By enabling others to give, it comes as a breath of fresh air, reinforcing the fact that as a medium of entertainment, radio has immense power to change lives and contribute to betterment of society. The Diwali special programming also includes other interesting segments such as Char Gaano ki Chakri or a sweep of four songs, humour capsules called Hassi ke Patake, capsules of encouraging news called Khushiyon ki Phuljhari, and Diwali ke Rang, where RJs will talk about how Diwali is celebrated in a particular region or state.